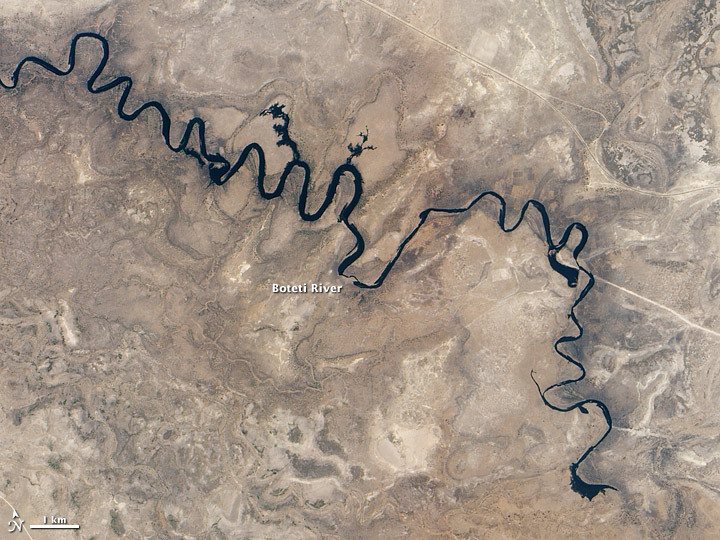 Starting in the late 1990s, insufficient rains left Botswana's Boteti River dry year after year. But in September 2010, water once again flowed through this riverbed. The region’s rainy season generally starts in October and ends in April. Much of the rain that falls on the highlands of Angola makes a long, slow journey to Botswana’s Okavango Delta. If more water flows into the delta than it can hold, some continues southward through the Boteti River. 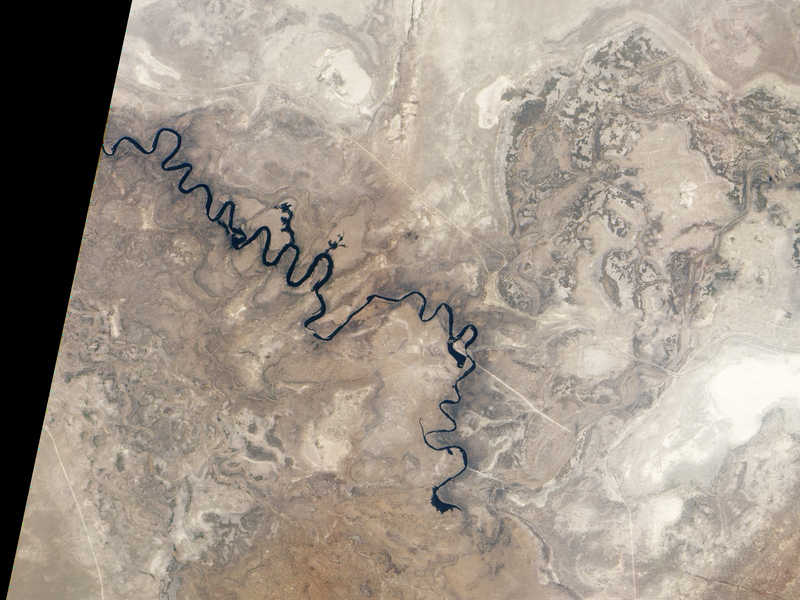 The Advanced Land Imager (ALI) on NASA’s Earth Observing-1 (EO-1) satellite captured this natural-color image of the Boteti River on September 29, 2010. Arising from overflow in the Okavango Delta, the Boteti flows toward the southeast before turning northward into the expansive salt pans of Makgadikgadi. This image shows the river stopping short of Makgadikgadi, which lies to the east. The river follows a long series of hairpin curves. On the outer loops of some curves, the river overflows onto nearby flood plains. (Two such overflows are obvious near the center of the image.) In the east, another overflow takes the approximate shape of a boot. Here the water has probably flowed onto agricultural fields. Near the lower right corner, the Boteti River grows shallow and narrow, then terminates. The water supply may still be insufficient to drive the Boteti onward into the nearby salt pans. According to Frank Eckardt of the University of Cape Town, the presence of any water in the river valley had become unusual by 2010, and some observers thought the Boteti was a dead river. 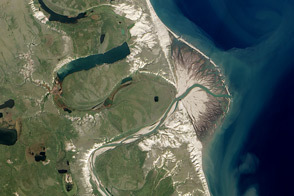 Naturalist blogs reported that the Boteti held some water in September 2009, but according to Eckardt, its last major flood occurred in 1991. Outside of the river valley, the dry season has parched the landscape. Nearby river valleys, flood plains, and salt lakes appear in tones of beige and brown. Images of the surrounding region, acquired by the Moderate Resolution Imaging Spectroradiometer (MODIS) on NASA’s Terra satellite show strong seasonal differences between early June (when green vegetation predominates) and early October (when the region appears in shades of brown except for the Okavango Delta). NASA Earth Observatory image created by Jesse Allen and Robert Simmon, using EO-1 ALI data provided courtesy of the NASA EO-1 team and the United States Geological Survey. Caption by Michon Scott. Acquired September 29, 2010, this natural-color image shows part of the Boteti River, filled with water overflowing from the Okavango Delta. BirdLife Botswana. (2009, September 22). Will Lake Xau fill? Accessed October 7, 2010. Botswana Safari. Botswana Seasons Guide. Accessed October 7, 2010. Earth-Touch.com. (2009, September 7). Boteti River flows once again. Accessed October 7, 2010. Encyclopedia Britannica. (2010). Boteti River. Accessed October 7, 2010. Okavango-Delta.net. Okavango Delta Information. Accessed October 7, 2010.